Jeez, is it really that slow a news week? 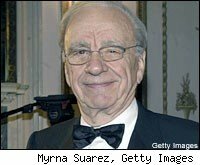 Sure, Rupert Murdoch made some news on News Corp.'s fiscal-year-end earnings call yesterday, declaring that the company will adopt pay models for all its news websites by this time next year, including the websites of Fox News, the Sun and News of the World. But Murdoch certainly didn't say what a lot of people, including Newser's Michael Wolff and reporters for the Financial Times, seem to think he said: to wit, that all of the content on those sites will henceforth cost readers money to access. The people who think he said this also think it's a bad idea -- not surprisingly, because it would be. "His uphill fight is probably even greater than it might appear," crows Wolff. "[H]e's swimming against the tide." In fact, Murdoch is swimming very much with the tide -- the tide of publishers cautiously exploring models under which they'd charge some users to access some content. That, of course, is what Murdoch's Wall Street Journal has been doing for years, and there's no reason to assume he wouldn't take the Journal's model and extend it to other News Corp. websites, rather than simply throw up a one-size-fits-all pay wall around them. In fact, that's exactly what Murdoch said he would do on yesterday's conference call: "We will be using our profitable experience there [ie. at wsj.com] and the resulting unique skills across News Corp." Those of us who were paying attention heard him clearly. So stop hyperventilating, folks. Murdoch didn't say anything a dozen other publishers and media executives haven't already said. As usual, he just said it louder.